If you walk through a stationery aisle every now and again, it’s likely that you’ll have at least a passing familiarity with the Pilot Dr. Grip. At my corner store, for example, there’s always one situated alone and awkwardly, hanging between a row of BICs and a row of store-brand gels. Well, Dr. Grip, the time has come to take you off the rack and out for a spin. Despite the small amount of shelf space it’s often given, the Dr. Grip has its fair share of fans out there. It’s a thick pen with a large and rubbery grip, which makes it quite comfortable to write with. In fact, it is probably intentional that the pen’s name, Dr. Grip, suggests a somewhat therapeutic product. 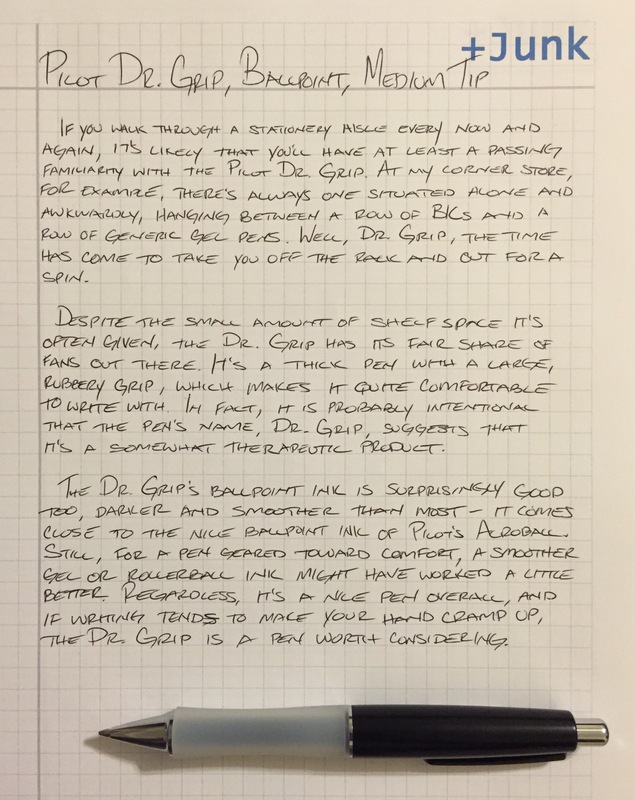 The Dr. Grip’s ballpoint ink is surprisingly good too, darker and smoother than most – it comes close to the nice ballpoint ink of Pilot’s Acroball. Still, for a pen that is geared toward comfort, a smoother gel or rollerball ink might have worked better. Regardless, it’s a nice pen overall, and if writing tends to make your hand cramp up, the Dr. Grip is a pen worth considering.